Vertical head carriage floats with warped lumber: This feature reduces stress on the incising teeth for longer tooth life. This also helps maintain an even depth of incision in both sides of the material. 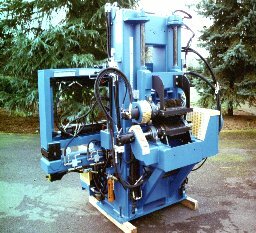 Automatic board stabilizer (air spring system): This feature stabilizes the high quality lumber as it passes through the vertical incising heads. This helps reduce edge damage on the lumber. Easily visible adjustment scales for precise depth settings. All adjustments are operated by a hydraulic manifold and valve system. Hydraulic accumulator adjustment system for longer tooth life and to allow for the various lumber thickness that you find in the larger timbers. Unlimited tooth and spacer patterns available. Self cleaning anti-lumber tear Stripix System. Powered by a hydrostatic transmission hydraulic system with remote control. Adjustable bottom horizontal incising head. Electric hoist with swing boom and trolley. Consulting service relating to incising. Related Wood Treatment Equipment and Specialty Products.